It is simple. We offer 7 days FREE TRIAL Robostopia™ Lite membership for everyone. /start our bot and send /help command to get list of commands. Every 9 minutes our bot checks your latest completed 50 orders. 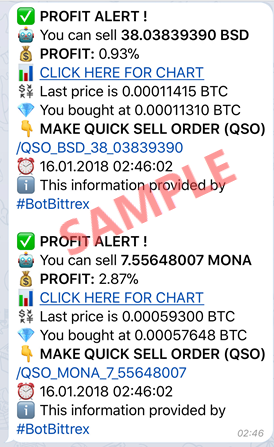 If any of them start making profit bot sends you notification. If you enjoy our bot after your trial finished you can renew it. Every user can only one time get FREE TRIAL membership. If you want to test Robostopia™ Pro features we can upgrade your TRIAL membership to Robostopia™ PRO. Just contact with us.